You will be collected from the Alice Springs airport this morning for your private 7 day 4WD adventure through the Red Centre. We depart Alice Springs on the unsealed Old South road to Napwerte (the Ewaninga Rock Carvings). Here we view rock engravings (petroglyphs) which are a valuable link to the activities of early Arrernte Aboriginal people. We continue on this road through the James Range and turn off onto the unsealed Hugh River Stock route which connects us to the Stuart Highway. After checking into our accommodation at Stuarts Well roadhouse, we hit the dirt again and head out to Rainbow Valley. After a scenic drive in, we reach the reserve, featuring free-standing sandstone bluffs and cliffs with stunning coloured rock bands, which form part of the James Range. It's simply stunning at sunset ! This morning we travel along the Lassiter Highway to the Uluru Kata Tjuta National Park. The park is world heritage listed for the importance of it's natural phenomena and it's cultural significance. We stop en-route to view Mt Connor (Artila), which is situated on Curtin Springs cattle station and is a 244m high mesa, or isolated table-top mountain. We reach Yulara, check into our accommodation and then depart for Kata Tjuta meaning "many heads". The enormous domes, 36 in total, rose out of the sand and weathered over millions of years, they are now rounded peaks. The tallest, Mt Olga, is higher than Uluru ! Experience the sheerness of the domes and the vastness of the landscape on the Valley of the Winds walk, which takes you down into the valley for breathtaking views. An alternative, easier walk is the Walpa Gorge walk, which is a rocky track that gently rises to stream, passing rare plants and ending at a grove of spearwood. Walk within the sheer walls and experience this amazing landscape. This evening we'll have our first opportunity to view the world famous Uluru sunset. Enjoy champagne and nibbles as you watch the remarkable changing colours of Uluru as the sun sets over the desert landscape. Reflections from the rock and clouds in the sky, enhance the vivid colours. There are a range of dining options at Yulara Resort, including the Outback Pioneer cafe or restaurant and the other hotels in the complex also have restaurants. After an early breakfast we make our way out to Uluru, where you can choose to climb or take a guided walk around the base (9km) which includesthe Mala walk and Mutitjulu waterhole, home of a wanampi, an ancestral watersnake. After your climb / walk, we visit the cultural centre, which will introduce you to the foundation of the Anangu, the Tjukurpa, the traditional law that guides Anangu daily life. The rest of the afternoon is free for you to take an optional tour such as a Harley Ride, a helicopter flight, dot painting workshop, or join a free cultural experience at the resort such as Bush Yarns and spear and boomerang throwing. This evening you may like to take the Sounds of Silence dinner experience, which includes canapes and chilled sparkling wine served at sunset, while a didgeridoo plays, a traditional Aboriginal dance performance under the Outback sky, a star talk and bush tucker inspired buffet that encorporates native bush ingredients such as crocodile, kangaroo, barramundi and quandong. For those not taking the Sounds of Silence dinner, there will be another opportunity to see the Uluru sunset. This morning we have a leisurely start and head north on the Luritja road towards Kings Canyon and to our accommodation at Kings Creek Station, a working cattle and camel station, owned by the pioneering Conway family. The rest of this afternoon is free for you to relax or take an optional tour such as a camel ride, quad bike rode or helicopter flight. Or take a walk to the lookout, we can drive to Kathleen Springs for a wa lk or simply have a swim in the resort pool. This morning we travel to Watarrka National Park (Kings Canyon). 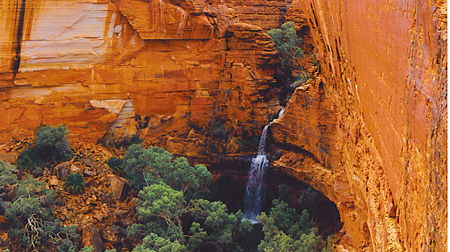 The sheer red rock face of Kings Canyon soars over 100 metres above dense forests of palms, ferns and cycads, sheltering them from the surrounding desert conditions. The rim walk takes in magnificent views of the Canyon rim, the weathered, buttressed domes of "The Lost City" and the "Garden of Eden"- a sheltered valley with permanent waterholes and lush vegetation. An alternative option is the shorter and easier Kings Creek walk, leading into the centre of the Canyon OR the Southern Rim Return Walk which takes you along part of the Rim Walk. After Kings Canyon, we join the unsealed Mereenie Loop road to the Western MCdonnell Ranges. The trip along this road is an adventure in itself and is a lovely drive through some beautiful desert country. Keep your eye out for wildlife too. En-route we stop at Tylers Pass Lookout for views of Gosse Bluff Meteorite Crater and the surrounding landscape. We continue into Tjoritja (West McDonnell Ranges) where we'll be based for the next 2 nights. We spend today exploring Palm Valley, the last vestige of Central Australia's tropical past, being the only place in the NT where Red Cabbage Palms grow. Renowned for it's desert palm trees, cycads, small spring-fed pools and red gorges, Palm Valley is a magnificent place to visit and offers an interesting drive in ! There are a range of walks we can take in this picturesque area and it's very photogenic. We finish the day with a stop at the Mt Sonder lookout, which is one of the highest points in Central Australia, changing colours dramatically throughout the day. You'll also have the option of a swim at nearby Glen Helen Gorge. Today we explore the magnificent Tjoritja (West McDonnell Ranges), including Ormiston Gorge, Ellery Creek Bighole, The Ochre Pits, Standley Chasm and Simpsons Gap. The Ochre Pits are a colourful outcrop of ochre on the banks of a sandy creek that desert Aboriginal people once used to quarry. Ochre has always been an important part of Aboriginal cutlure and a vital part of everyday life, for ceremony, weapons and medicine. Ellery Creek Bighole is a spectacular waterhole in the mighty Ellery Creek, which cuts through a gorge in the ranges. Thousands of years of massive floods have carved out this beautiful waterhole and unlocked some amazing geology. It's also a great place for a swim! Aboriginal owned Angkerle (Standley Chasm) had been gouged from tough sandstone by the floods that, over untold millions of years, have surged down a narrow tributary of the Finke River system. The result is a deep red cleft, with slopes on either side rising 80 metres above the floor that are most dramatic in the early afternoon, when the chasm is drenched in a shower of brilliant red light, the sheer walls glowing from the reflected sunlight. Our final stop is Simpsons Gap, one of the most prominent waterholes in the region and home to the Black-footed Rock wallaby. The area around Simpsons Gap is a major stronghold for some of the rare and relict plants of the region , large stands of Mulga and ghost gums. We return to Alice Springs at approximately 6pm and you will be dropped off at your accommodation. This tour is only operated as a private charter (sole use of vehicle and driver guide), and is valid for travel year-round - please enquire for prices and further details. The above itinerary is only a guide to what we can offer. In short, we had a fantastic time on the tour. I can honestly say that the trip was exactly how i hoped it would be, but the experiences/ sites were better than i ever imagined. The beauty of the places we saw was incredible. So my first comment would be that the itinerary was spot on. The tour logistics were also excellent- everything went according to plan, everything was available, the pit stops were well timed, the vehicle was ideal, the accommodation was great, the food well- prepared and organized. We loved the added cruises and side-tours. As for David, well , he was one of the best parts of the tour. Dave was absolutely wonderful- always interesting and informative, a superb guide when it came to the sites, patient (although i'm sure we tested him !) and always happy to cater for our needs. He showed us the sites, gives us safety tips, talked to us about the wildlife, the stars, history as well as some of his own story. So overall it was brilliant. haven't topped talking about the trip since we got back and i would definitely recommend Sacred Earth Safaris to others.